2 13:45 Shore excursion to Fengdu - "Ghost City"
Yangtze Explorer, a well-designed and deluxe cruise ship, is regarded to be the prior choice of travelers to cruise on Yangtze River. 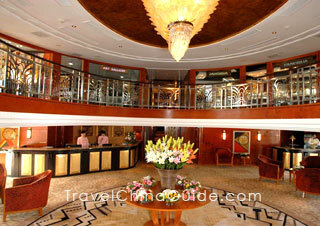 Quite different from other cruises which carry much more than 300 travelers, Yangtze Explorer only accepts at most 124 guests and offers them the most personalized, considerable, comfortable and wholehearted services. From March to November per year, there are many scheduled sailing dates of Yangtze Explorer between Chongqing and Yichang. In each four or five days voyage, you could have a good rest in the deluxe cabins or suites or the private balcony, enjoy the delicious food made by the Austria chefs in the imperial restaurant, and taste the champagne in the explorer bar. Besides, our onshore excursion arrangements will offer you a chance to explore the thousands of years' inland culture, appreciate the splendid scenery of the three gorges dam, and get to know the life of the pristine migrants from the three gorges area. 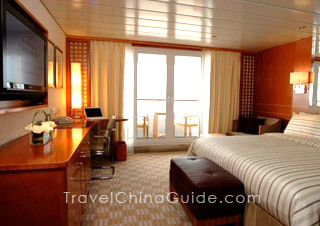 Yangtze Explorer is the home of the most spacious and luxurious deluxe cabins and suites among all Yangtze cruises, which offer you the most comfortable and thoughtful experience just as the international five-star hotels. The cabin features warm colors and natural materials giving enchanting neo-classic style: the soft Italian leather, French fabric, luxury timber and exotic facilities background the amazing gorges and river scenery sweeping past the large-sized private balcony. 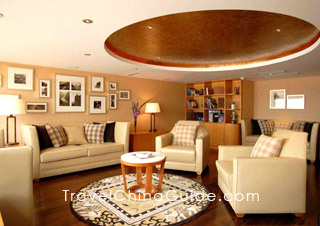 Yangtze Explorer comprises 38 deluxe cabins which are entirely different from other Yangtze River cruises, 20 standard suites and 4 deluxe suites, particularly the elegant and sophisticated imperial suites of which make Yangtze Explorer the most advanced cruise on Yangtze River. In order to offer you an more enjoyable cruising, Yangtze Explorer offers various lectures on culture, which help you learn more about local conditions and customs throughout the journey while enjoying the best facilities and services. The cruise also offers movies, Tai-chi playing, cooking class, mahjong playing, chess, bingo games, staff performance and other entertainments, or you can take a catnap on the deck enjoying the breathtaking scenery and sunshine of the grand canyon.